Traveling around Myanmar in three weeks on a low budget: As a solo female traveler, I had an amazing time backpacking from Yangon to Nay Pyi Taw, Nyaungshwe, Inle Lake, Bagan, Mandalay, Pyin o Lwin and Hsipaw. I went to Myanmar in July. The most impressive experience: The overnight trip on a slow boat from Bagan to Mandalay on the Irrawaddy River among hundreds of local travelers. If I would like to go back to Myanmar? Immediately. Myanmar is a great backpacking country with good public transport, nice and cheap street food and amazing historical sights. Even if hotels and hostels might be a little more expensive than in the rest of southeast Asia, you can manage to travel with a daily budget of less than 20 Euros by staying in hostels, enjoying street food and travel as local as possible in second and third class trains and furgeons instead of busses. You might be even able to travel with less than 15 Euros. Myanmar is full of friendly helpful, curious and open people, who are probably not yet fed up with tourists and travelers. That is probably because of the fact, that Myanmar has been isolated from the rest of the world for years. BBC News gives a helpful overview about the political situation in Myanmar right now. I also recommend Myanmar for women traveling alone. I met quite a few female travelers in Myanmar. I also met travelers on their first backpacking trip. It can be a little challenge and you need to be open-minded. But is perfectly manageable, if you don’t mind organizing a few things by yourself. Backpacking Myanmar, I just experienced a big input of very positive impressions. Arrival at Yangon airport in July. It was raining. But I didn’t care. I was more than happy, that I had got the Myanmar visa at the embassy in Bangkok and had been able to fly with Air Asia into the country from Thailand. In general, it can be cheaper to get a flight to Thailand and just travel on to Myanmar instead of flying to Myanmar directly. 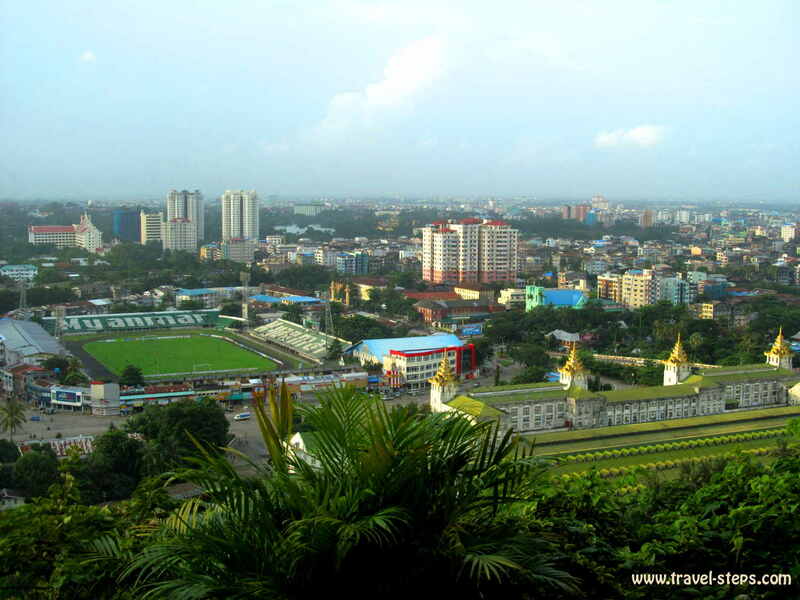 It’s also possible to apply for e-visas for Myanmar, when flying in to Yangon, Mandalay or Nay Pyi Taw. Get information about the e-visa here. I was ready to start my backpacking trip around Myanmar. Just me, my backpack and enough curiosity. Here I was watching men were wearing skirts and some women smoking cigars. 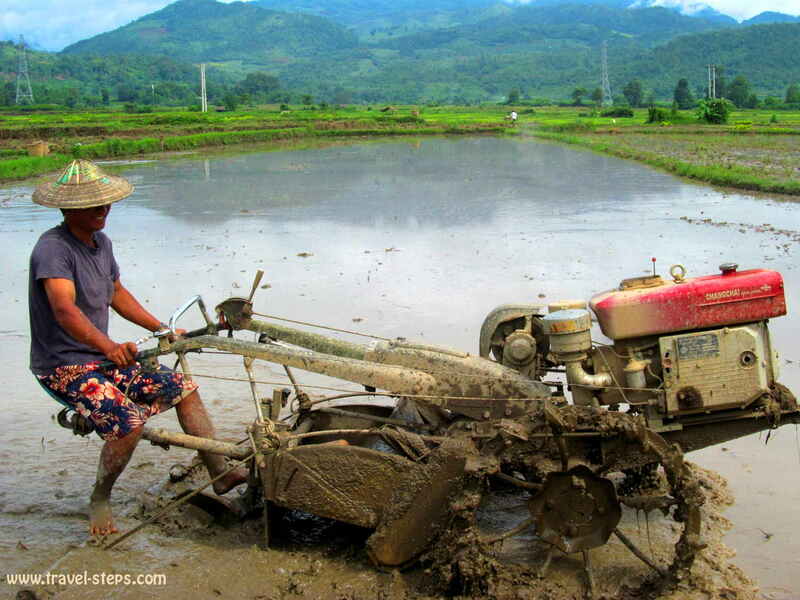 Myanmar was different from other southeast Asian countries. The following 3 weeks, I would learn a lot. About poverty and happiness. About myself. As soon as I walked into the city center, Yangon got me. The place was a feast for my senses. New impressions, smells, noises everywhere in the vibrant city. A lot of traffic. Many bicycles. You could buy electric sockets, fruits and raw meat at the street. I bought a few samosas. There was lot’s of Indian food available. It was cheap. I sometimes ate on the street for less than half a Euro. And I liked it. There were tall apartment blocks with clothes hanging in front of the windows to dry. Men were playing board games on the ground, women carrying baskets on their heads, kids selling postcards. All were looking at me, maybe even staring – and smiling. There were not a lot of travelers on the streets. And I really enjoyed the people’s friendliness and polite curiosity. I did not always like the attenion. But I was discovering a new world. And they were curious about where I was coming from. 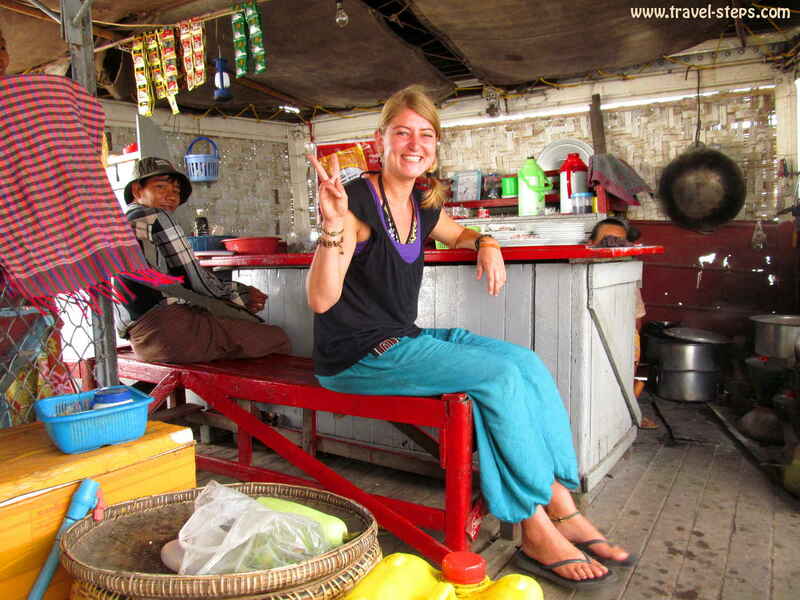 As a female backpacker traveling on my own, I felt secure and safe all the time and met a lot of happy, helpful, very approachable and polite people. And after a while, I got also used to the fact, that many were constantly chewing on betel nuts and showed their red teeth with every smile. And the Burmese smile a lot. It’s probably the most smiling people on our planet. 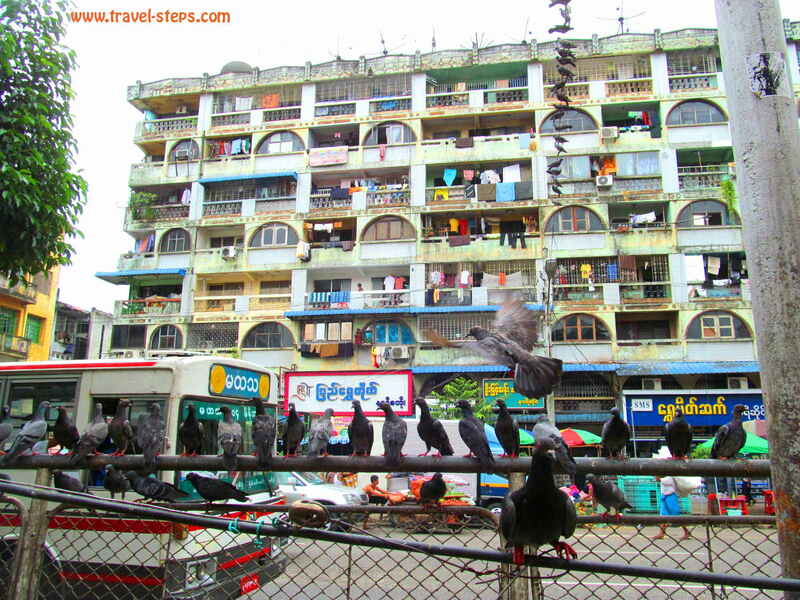 From Yangon airport, me and some other travelers, that I had met, shared a taxi to the city center. We were cruising around for quite a while. The taxi driver was a really nice guy, who did a little sightseeing trip with us and he perfectly understood, what we were looking for. It wasn’t very easy to find a very cheap accommodation to stay. There were a lot of rooms available, but some were sketchy, dark, uncomfortable and overpriced. Accommodation is more expensive than in the rest of Asia. But don’t expect to get better value for money. On the contrary. The hotel prices are sometimes ridiculous, if you consider how poor the country is. According to the news agency Reuters, Myanmar has set a minimum wage of 3,600 Kyat ($2.80) for an eight-hour work day in 2015. I finally stayed in the Japanese-style Okinawa Guesthouse for the first days. In total, it was fine. It got mixed reviews on Tripadvisor. But there were other backpackers hanging around. For me almost the most important criteria, when I travel by myself. And the second day, I even met a cool female traveler, so that we decided to share a room and save some money. Okay, I have seen a lot of temples in Asia, many golden stupas, many spiritual monuments. I know, that some travelers get sick of seeing so much cultural heritage. After a while, they avoid pagodas wherever possible. 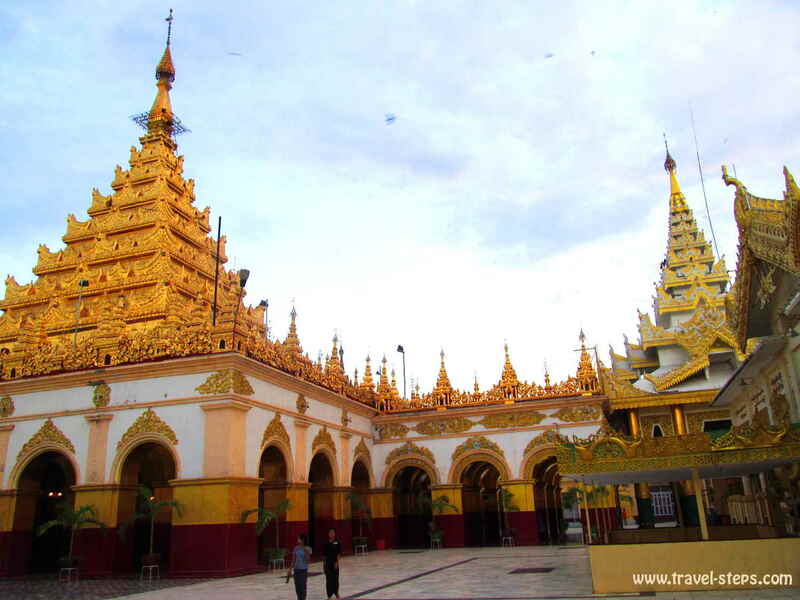 But the Shwedagon Paya in Yangon ist still worth a visit. 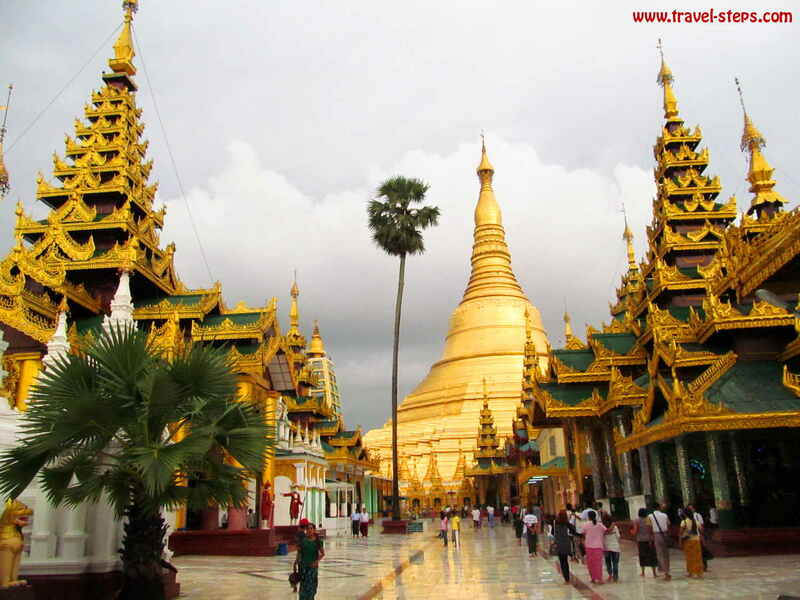 The Shwedagon Paya is 2500 years old and consists of 82 buildings. The entrance fee for foreigners is 8 US-Dollars. 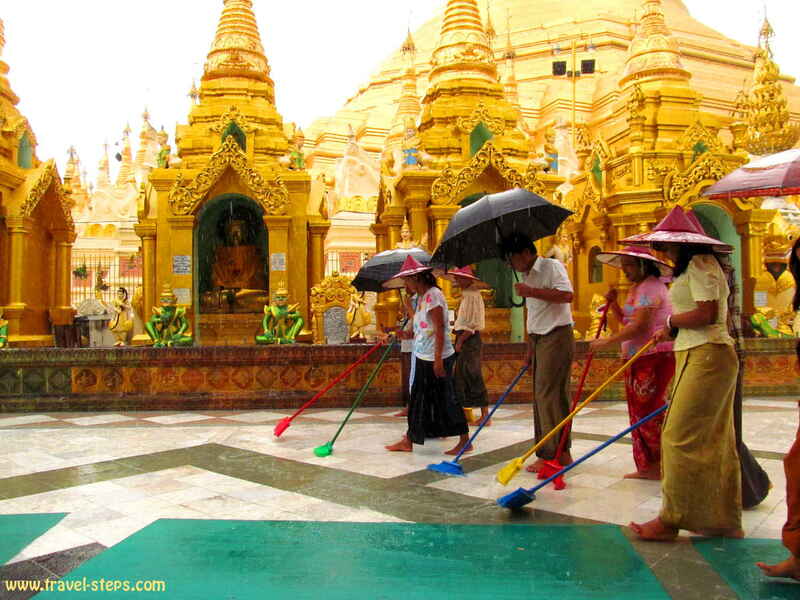 Every good Buddhist in Myanmar will do a pilgrimage to Shwedagon Paya once in his life. It’s massive. I thought, it was fascinating, although I got there on a rainy day. It was still great and funny to see the staff going bare feet swiping the water out of the visitors way. There is a public bus going there from the city center. 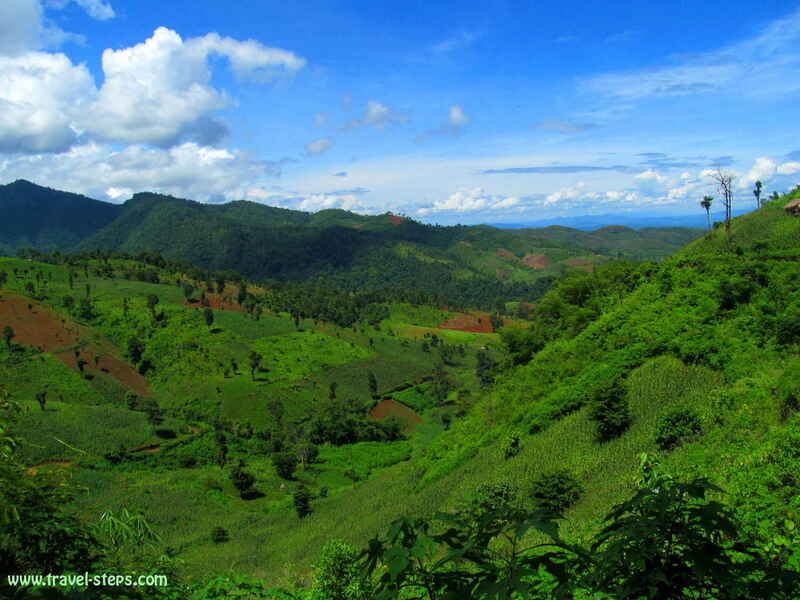 On this website, you can check out entrance fees of all sights in Myanmar. 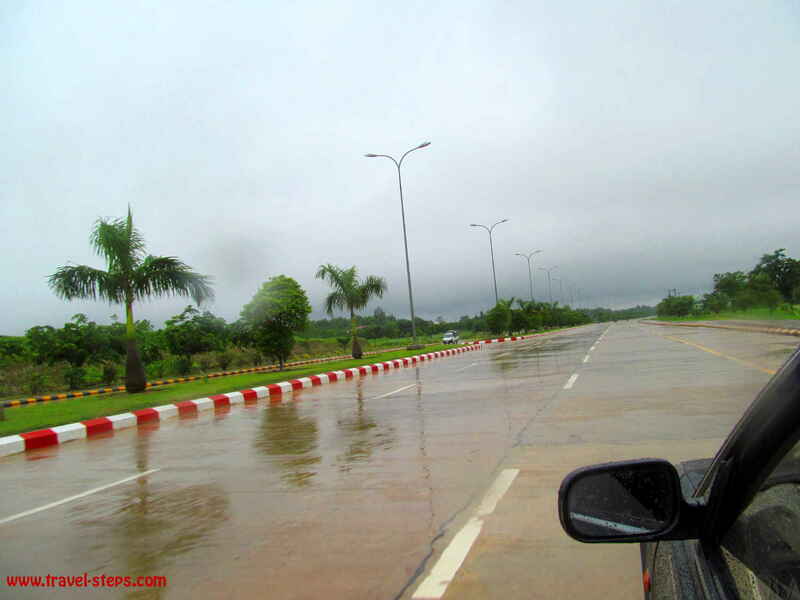 On the way to the Inle lake, I did a stopover in Myanmar’s capital Nay Pyi Taw. I had heart weird stories about that artificial place created by the regime after consulting an astrologer. It’s a very modern new town just set up in the middle of nowhere. And it does not seem to have a soul. There is no life in Nay Pyi Taw. The place was chosen with the help of astrology. I love bizarre places. So I took a bus there. As far as I could see, there was no public transport in that town. Well, there were hardly people in the streets. I was wondering, if anyone was really living there. The good thing is that everyone in Myanmar is happy to do business. Within minutes, I found a private driver at the bus station, who agreed to do a 2 hours city trip with me. 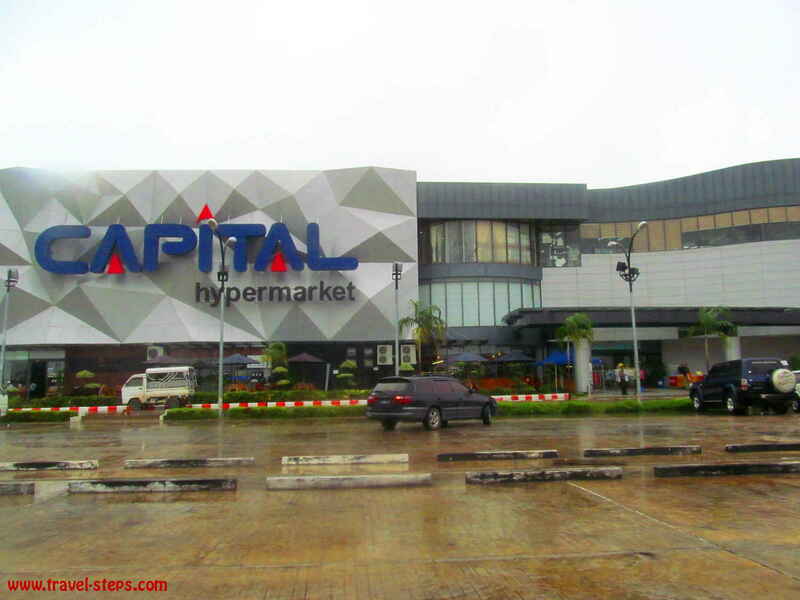 He showed me all the famous attractions of Nay Pyi Taw, the empty shopping mall, massive boulevards without traffic, a reconstruction of Yangon’s Shwedagon Paya. It was raining, when I was there. I was basically the only visitor – not sharing the temple with hundreds of other visitors like in Yangon. The driver was even carrying an umbrella for me when we got off the car. Even if there was hardly any communication in English possible, it had been a good idea to get around by taxi as I caught the spirit of the whole town within a short time. 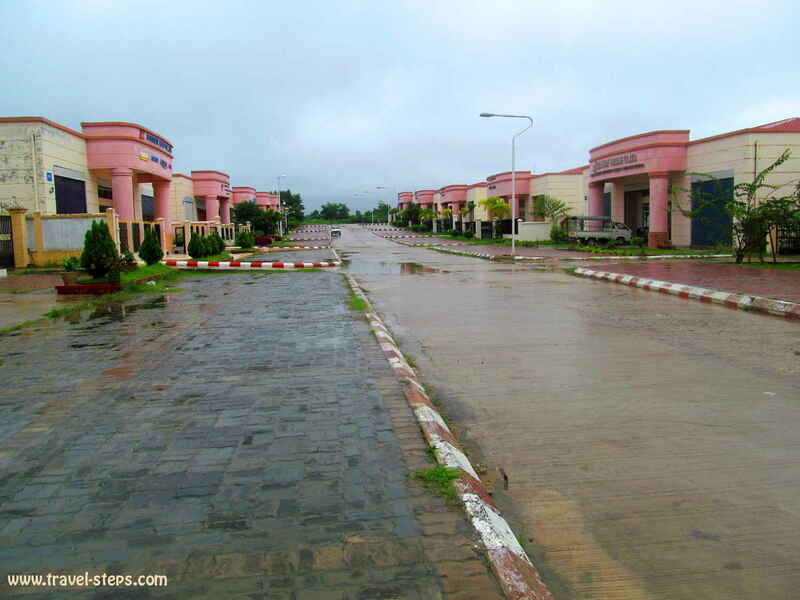 Nay Pyi Taw looked like an abandoned playground for adults. It was probably the most bizarre town, that I have seen in Asia. The funny thing was, that I watched a movie two weeks later in a cinema in Myanmar, that was set in Nay Pyi Taw. Well, I didn’t understand a word of the film as there were no English subtitles, but you were able to see, that they didn’t have the money for extras to fill up the city. And the main characters of the film were leading a life in wealth, that had nothing in common with daily life reality in Myanmar. I had planned to stay the night in Nay Pyi Taw, but I finally took the bus to Naungshwe, close to the Inle Lake, just the same evening. It didn’t make sense to me to stay much longer. The whole city didn’t make sense to me. Get more official information about Nay Pyi Taw here. 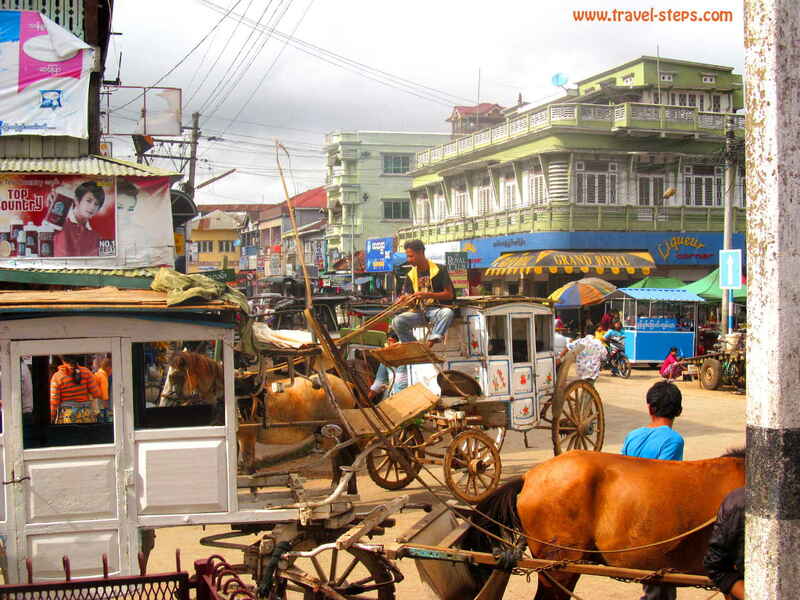 Get information about public transport and bus routes in Myanmar here. The bus arrived a 3 am at Nyaungshwe, the small town close to the famous Inle Lake. It was still dark outside. No idea, where I was and where to go. There were cars standing at the bus stop in the middle of seemingly nowhere. Luckily, there were some more travelers around, so that we could share a pick up to find accommodation. The driver was super sweet and very helpful. He knew exactly, where to find nice low-budget rooms. And he didn’t hesitate to wake up the guesthouse staff in the middle of the night. I stayed at a guesthouse called Remember Inn, Myawady Rd. After a bit of bargaining, I paid 10 US-Dollars for one person in a double room. Usually, it was much more for a double room. Prices in 2016 had risen to 20 US-Dollars for the cheapest double room. 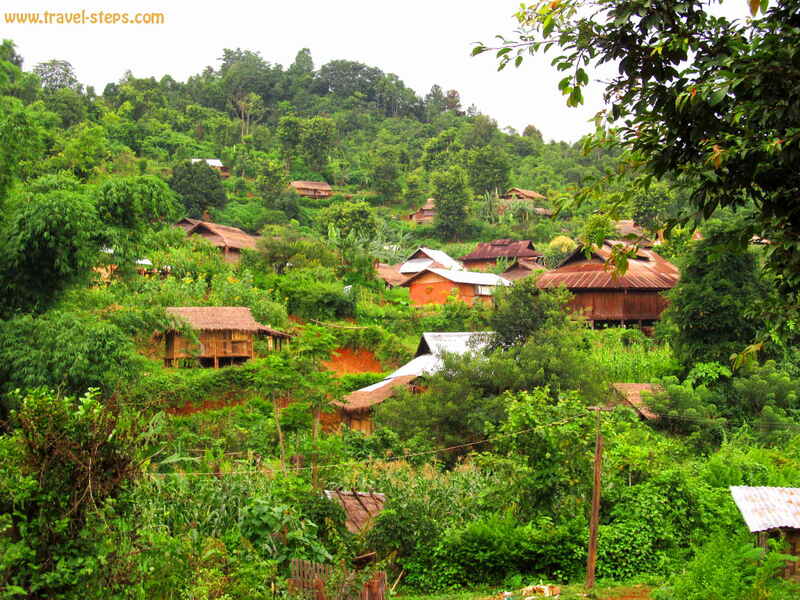 After some sleep, I started to discover the village Nyaungshwe. No paved roads, basic buildings, a lot of small shops and a lot of happy people in between. I enjoyed the atmosphere, the slow pace of life. I watched the long-tail boats on the small canals. I even found an internet cafè with a terribly slow connection. I waited a few minutes for the website to build up. Just to understand, that my email account had been blocked by the provider. No idea why. I almost freaked out. My phone wasn’t working, my email account useless, the internet crap. In Nyaungshwe, I went to watch Aung’s Traditional Puppet show. 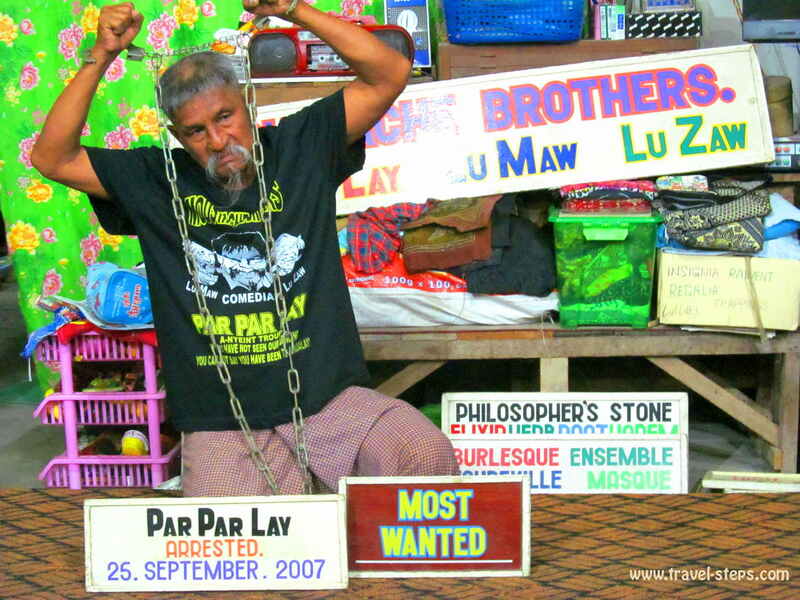 Well, still cheaper than a traditional puppet show in Yangon, but probably not better. Well, it is a traditional thing. I basically watched puppets dancing on a stage for 30 minutes while traditional music came out of bad old speakers. Don’t ask me about the story. I didn’t get the point. But Aung was lovely, served tea to the tourist audience and let us try playing the puppets after the show. I enjoyed the experience, but don’t need to watch a second puppet theater show ever in my life. 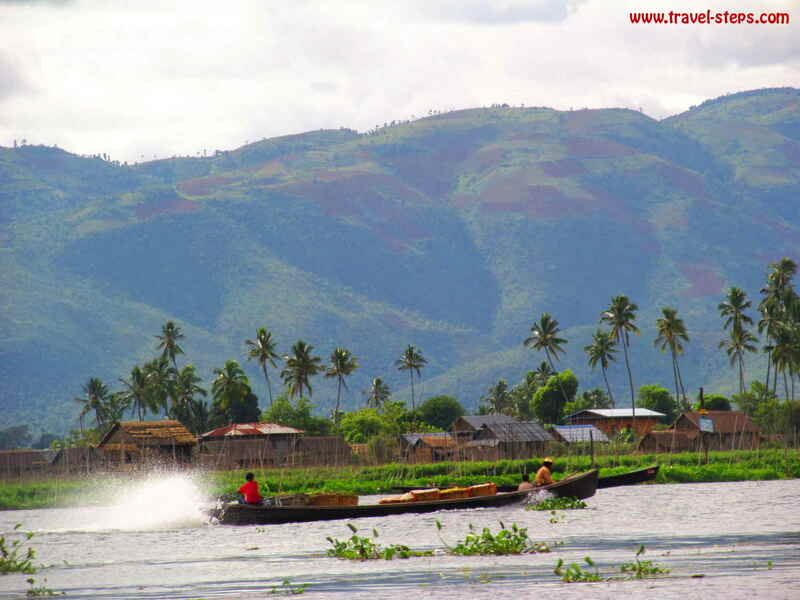 The reason why tourists come to Nyaungshwe is, that they want to do a long-tail boat ride on Inle Lake, plunge into the mystical atmosphere of an overwater world, that hasn’t been affected by the modern’s world destruction. But no worries, it will get affected soon. The country opens up. More and more tourists are coming. There will be probably more and bigger boats soon. But we still saw the fishermen doing their work in the morning, villages on stilts, women washing clothes, some traffic on the water. We arrived at a little market. It was beautiful. Authentic. Women sitting on blankets on the ground selling nuts, chilies, ginger and a lot of things, that I haven’t seen before. Tribeswomen walked around in colorful traditional dresses carrying baskets on their heads. Countless boats stopping there, guys trading with wood. A lot of tourists had been around on the markets around Inle Lake taking countless pictures with big expensive cameras. I would have loved to take a lot of pictures as well, but that kind of behavior somehow created a barrier between the tourists and the locals. I felt slightly uncomfortable. I still took some pictures from a distance. Yes, I was a tourist. Yes, I wanted to keep some visual memories, but I would have rather talked to the local women. I didn’t really dare to do that. And obviously, I didn’t speak their language, they didn’t speak mine. They looked shy. It Yangon, the locals sometimes were really keen on getting photographed. Here, the situation was different. Part of our little boat tour organized by my guesthouse was to visit some stupas and also quiet a lot of artwork factories. Wooden houses on the water, where people showed and sold traditional artwork. We saw umbrella makers, painters, weavers, blacksmiths producing jewelry. We were just three people in my tour group. Me and two American women, mother and daughter. All backpackers. We all were not really keen on buying lot’s of stuff. We were probably a real disappointment to the shop owners. But a lot of tourist boats were stopping there. And in the end, I bought some cigars consisting of sweet tobacco, honey, anis, and carrot. But after that, we told our guide to stop the factory visits. No more factories. 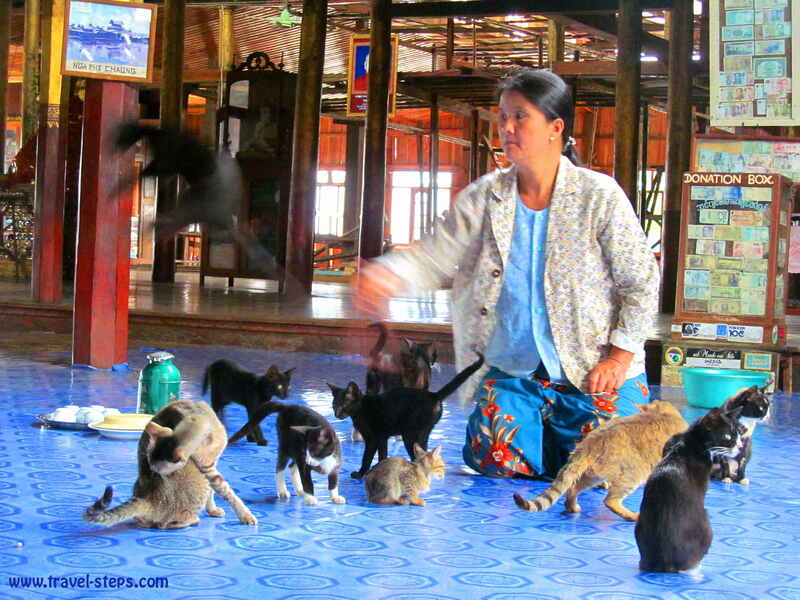 One of the highlights of the trip around Inle Lake were the jumping cats at the monastery of Nga Phe Kyaung. There are women, who had trained the cute cats to jump through a hoop. And it was really funny and impressive to see it in a beautiful location like the monastery. If the cats enjoy it as much as the tourists? No one knows. 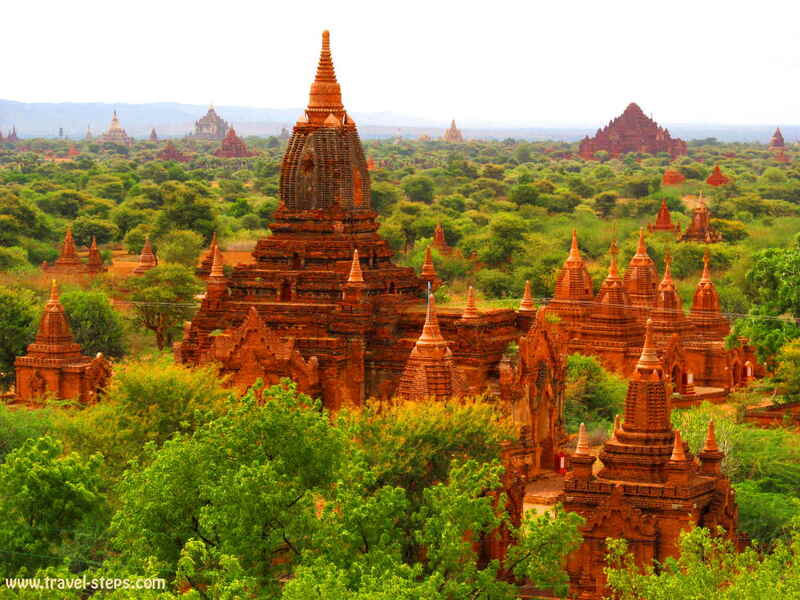 You cannot visit Myanmar without having seen Bagan. 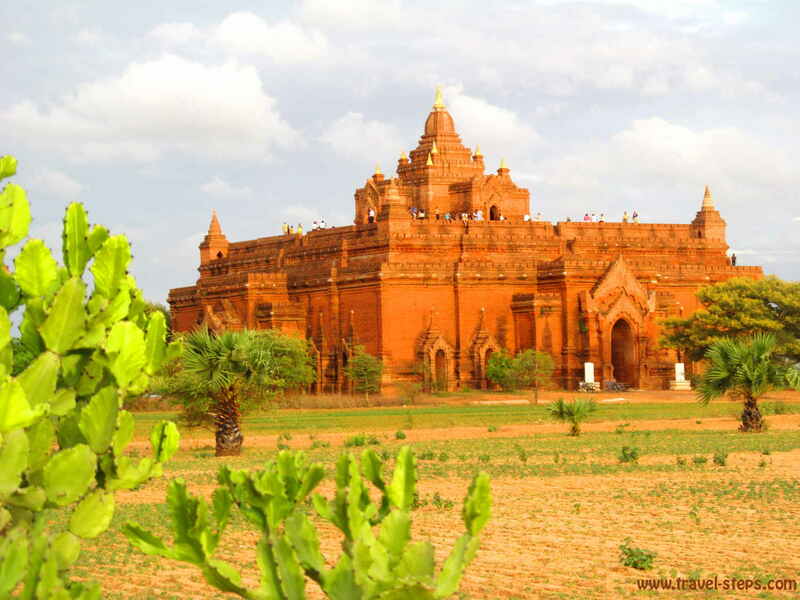 The Unesco World Heritage Site of Bagan the place to be. It’s overwhelming to pass trough a countryside with just countless temples around you shimmering bronze or golden in the sunlight on red sand in a sparse inhospitable landscape with some cactus and palm trees around. The best way to discover the place is by bicycle, that you can rent in Bagan town. The World Heritage site is amazing. Not so much each temple by itself, but the mass of ancient buildings was fascinating. I loved it and spent two days cruising around on a rental bike from my guesthouse through the Bagan Archaeological Zone. Since March 2016, foreigners have to pay an entrance fee of K25,000 The ticket is valid for five days. The Archaeological Zone has been put on the Unesco’s world heritage list in 1996. As the Unesco states: “The site measures 13 by 8 km and contains more than 2500 Buddhist monuments (temples, stupas, monasteries, etc) built from the 10th to the 14th centuries AD.“ If all the entrance money goes to the maintenance of the site? According to the Myanmar Times in March 2016, it has not been the case in the past. Read more here. Until March 2016, it was fine to climb up to the temples. But with the exception of 5 temples, visitors have been banned now from temple climbing due to bad behavior and accidents. The article in the newspaper “The Telegraph” explains the situation quite well. 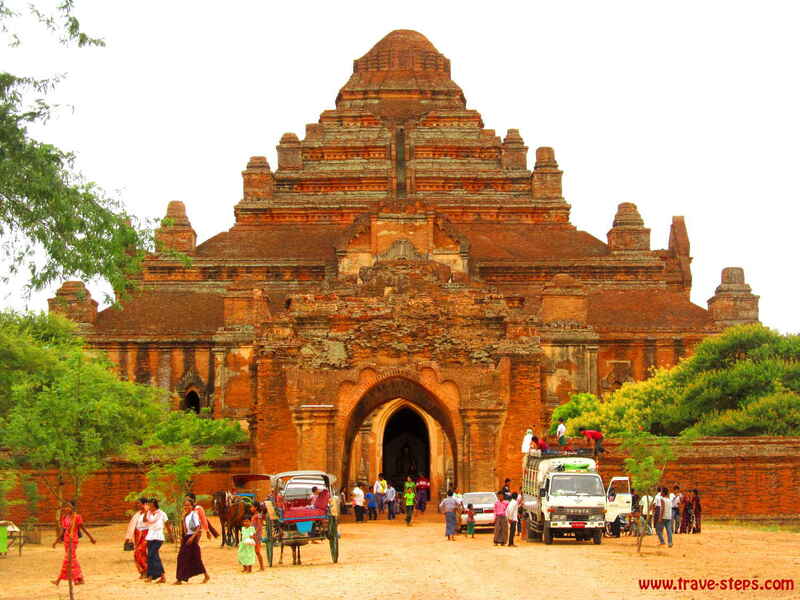 I myself witnessed a very shocking accident at the Bagan temple in 2012. Together with a traveler from New Zealand, I was discovering the temples of Bagan on rental bikes. In 2012, it was still possible to climb up every temple. We were looking for a good temple to watch the sunset. We climbed up maybe five meters and met some travelers from Canada and England up there. There were no guards to stop us. But there is also no safety net underneath. We were all chatting and enjoying the atmosphere until we suddenly saw one of the Canadian girls standing up, losing the balance and falling down. Maybe two meters. Her body bumped against the stones and then she was laying on a rocky temple platform. Dead still. We were completely shocked. I felt paralyzed for some seconds. It felt as if my own heart stood still. Then, we all jumped down as fast as possible. She was unconscious, but still breathing. Her sister started to cry. We all tried to get her back to consciousness, while one guy was running to the street to stop a car to call the ambulance. No one had a working mobile phone. Back then, it had not been easy for tourists to get SIM-cards in Myanmar. Probably, there was no mobile phone connection anyway. None of us had any idea about what to do really. It took just ten minutes till the ambulance came, basically a random car without any equipment. The driver didn’t have a clue about first aid. And there was no other way to get the girl down from the temple than to make her walk with our support. Luckily, we had some flashlights and head torches with us. The girl was totally confused and under shock, but she was able to get up and to move. She was in pain and had some obvious bruises at her body. The next hospital was a 45 minutes drive away. Her sister went with her in the car. And we had to move back their bikes a few kilometers to the village, where their guesthouse was. There was no other way. After we had walked back, we went together to a restaurant to take a drink. My heart was still beating fast and I was more than relieved the next day, when I heart, that she was okay and released from hospital after the examination. She had been lucky. To get to Bagan from Naungschwe, I had to take the bus. It had been a bit difficult to catch the bus in Nyaungschwe, which left at a junction 13 kilometers out-of-town. It makes sense to arrange transport to the bus stop the day before. Bagan seemed to be more a village than a town. The roads were mainly unpaved. On one side of the town, there were nicely set up restaurants catering for tourists. On the other side of the town, you were able to find local places with inexpensive authentic food without candles on the tables lacking the romantic atmosphere, that many holidaymakers are looking for. Both are worth to discover. It always depends on your budget. Mine was very low. I stayed in a cheap guesthouse and was at that time the only western traveler staying there. At one temple in Bagan, we met a monk, that was also on a sightseeing tour. I looked at him curiously, at his orange dress, the shaved head. I didn’t dare to speak to him. I wasn’t sure, what to say. Suddenly, he came over to my travel mate and me, smiled and asked us in good English to pose for a selfie with him. It was a very funny situation. I was happy, that he did that. It made him appear more approachable. We started to chat. And that is, what I love about traveling. There are always prejudices to fall, people to understand, different cultures to discover. It’s all about communication on a personal level, eye to eye, exchanging smiles and understanding. And about traveling on with more knowledge. Red, orange, purple, the sunset was amazing. It was a very good start for my boat ride on the slow boat upstream from Bagan to Mandalay. 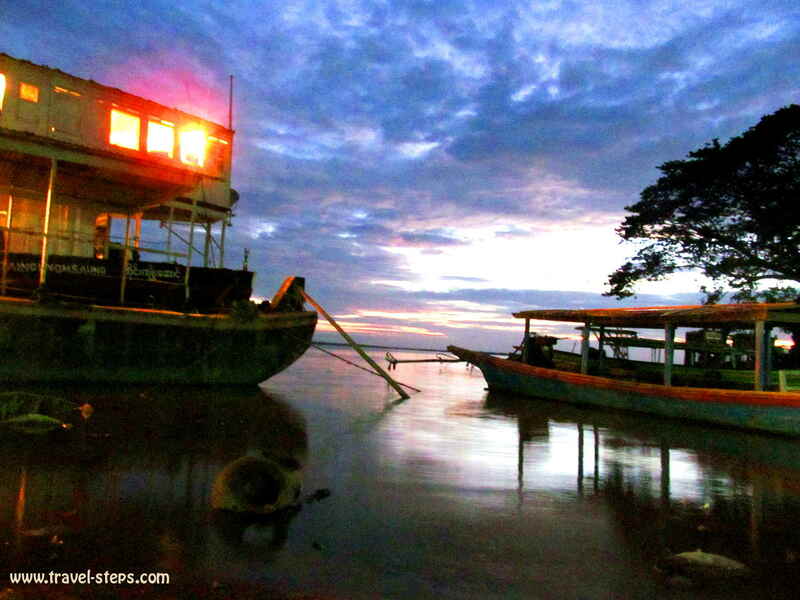 30 hours – two days, one night – on the Irrawaddy river. Just me, the water, a few hundred curiously smiling locals on deck, a lot of luggage, half a dozen pigs and the view on the muddy water. It was an amazing experience. There are a few different boats leaving to Mandalay. Many tourists take the more expensive fast boats. But whenever I spoke to locals, they assured me, that the slow boat, a government-run ferry, would be the most impressive experience. And it truly was. It wasn’t so much about the view, although the big Irrawaddy river was impressive. It was about the people, I met. The trip was 15 US-Dollars for foreigners. Locals paid something like 1 US-Dollar or even less. I bought the ticket just on board a few minutes before the boat left. And I understood, that the slow boat just takes around 9 hours going downstream from Mandalay to Bagan. When we left Bagan with the sunrise, the ship was almost empty. I was able to spread my blanket and sleeping bag on the wooden floor of the upper deck. I got also offered a plastic chair, which I didn’t really need. Already a few hours later in Pakokku, a few more passengers came on board. Women, that stared at me, admired my mascara, wanted to sell or exchange beautiful self-made blankets against mascara, perfume, t-shirts. Well, unluckily, I was just carrying the most necessary things and had nothing to exchange and seriously not the possibility to go on backpacking with some blankets in my bag. But for the tourists on vacation, it is a perfect chance to buy some great souvenirs. 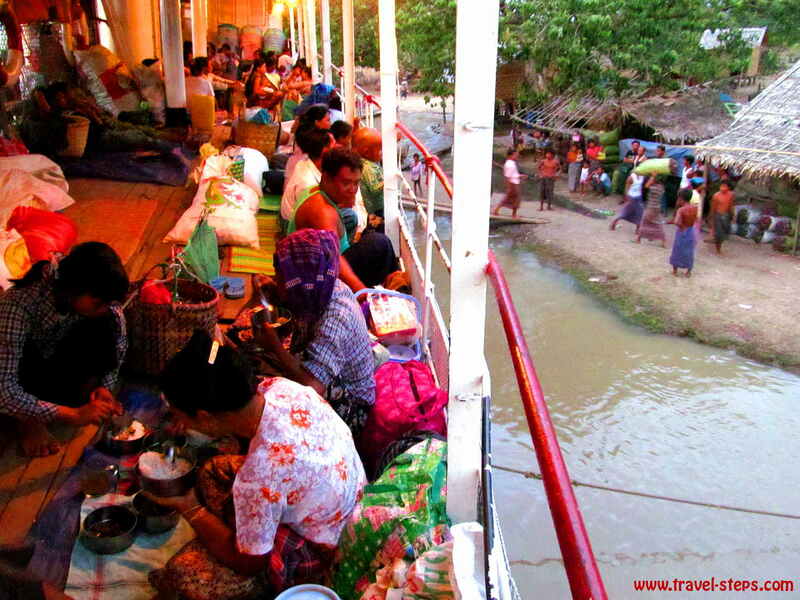 In the evening, the slow boat from Bagan to Mandalay had already filled up with an estimated number of 200 people plus a lot of luggage. Everyone sat on the floor. I was the only tourist. Everyone was staring at me, smiling. After a while, the ladies started offering food, food and more food. There was even a restaurant on board, where you could get something like fried rice, but almost everyone had brought his own bowls, plates, cutlery and of course homemade food. And I had to try everything. No refusal got accepted. Still, I tried the restaurant once. The guy, who was responsible for the restaurant, spoke a little English. He told me, that lived on the boat with his whole family and his baby among the passengers. The female passengers started to make compliments about my hair and my traveler jewelry. Everyone was showing me his or her baby. Some were smoking special self-made cigarettes The most fascinating thing for them was, that I was wearing mascara. The funny thing about traveling by slow boat from Bagan to Mandalay was, that we were not able to communicate properly, because I didn’t speak Burmese, they didn’t speak English. In the end, I was even drawing pictures of my family in my diary for them. They wanted to know, which countries I had already traveled and where I still wanted to go. Some hadn’t even traveled very far in their own country, so they were really interested to watch the pictures on my digital camera of Bagan or Inle Lake. They were really impressed, that I was traveling by myself and asked again and again, if I was married – and if I maybe wanted to eat more rice. One staff member showed me a book with the title “Learning six languages”. Coming from a different cultural background, to me, it was a collection of the most useless words in languages like English, Japanese, Thai and some others. 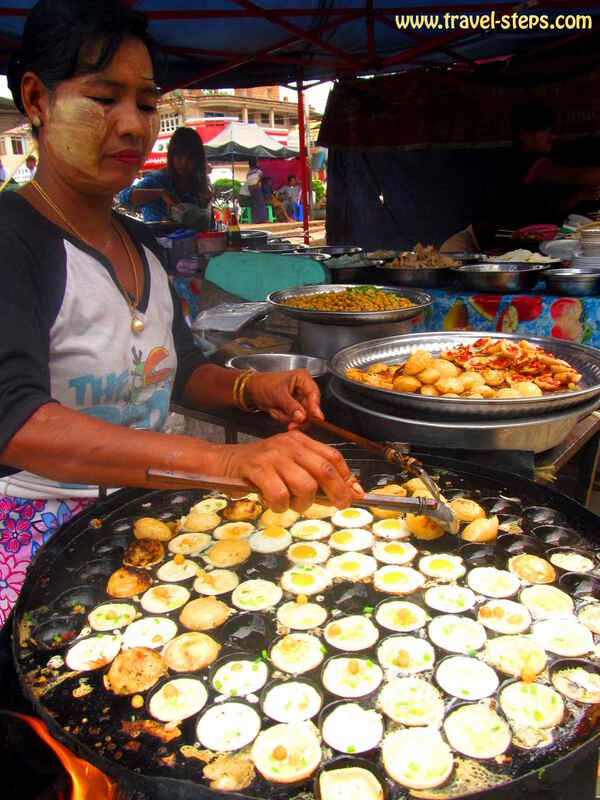 It was about questions like “What did you have for lunch today?” In Myanmar, it all makes sense. And I was happy, that the people shared their time with me. Another guy gave me his MP3 Player to listen to some Burmese rap, which was really cool. I learned to write and to count Burmese numbers and to write my name in Burmese letters. In between, the ship stopped a few times. There were women coming on board selling fruit and vegetables. More passengers came on board. Moreover some pigs, that had been carried on the ship by a few strong men. They were traveling on the lower deck. I always had to walk trough them, when I wanted to use the toilet – basically a whole in the ground of the ship with a door. 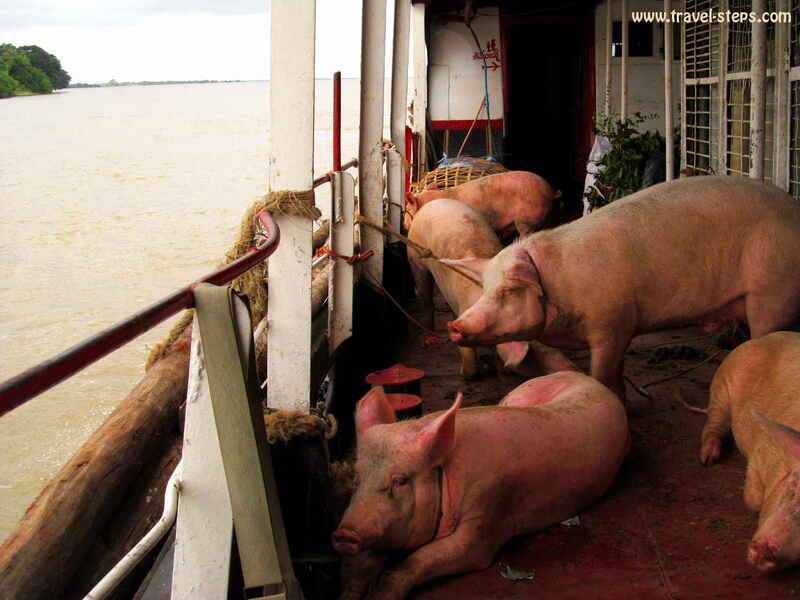 I have to admit, that traveling on the slow boat from Bagan to Mandalay got a bit exhausting after a while. I was constantly in the middle of attention. I had to smile back to everyone. I didn’t have one minute of privacy. But on the other hand, I was overwhelmed by how friendly and how extremely nice people in Myanmar are just everywhere. They are probably the most welcoming and generous people, that I have ever met in my life. Sharing everything was just so normal for them. In some other countries, I felt sometimes insecure, didn’t dare to communicate with people in every situation. Normal. But in Myanmar, I felt as if there are no bad people around. I felt very good and am very thankful about that experience. In the evening, the boat had become really crowded. To sleep, we all had to lay on the floor of the upper deck, relatively close to each other and our luggage. The boat stopped for the night in a small village. I was really tired after a long day and a lot of impressions. I was happy, that I had my own sleeping bag. 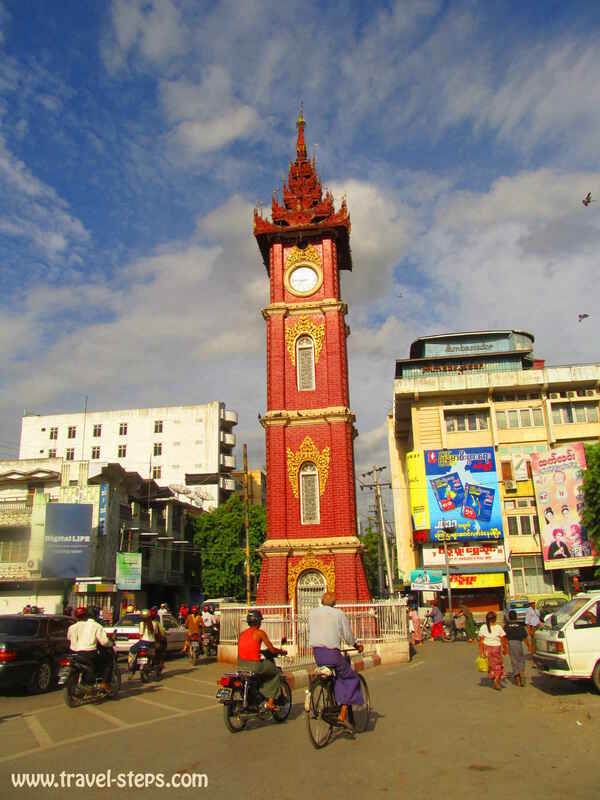 The next afternoon, we arrived in Mandalay. But before, I had to take a lot of pictures of a lot of people. All wanted to watch their pictures afterwards on he screen of my camera. I realized, that many people live very very basic and don’t possess anything. No cameras. And no pictures of themselves. 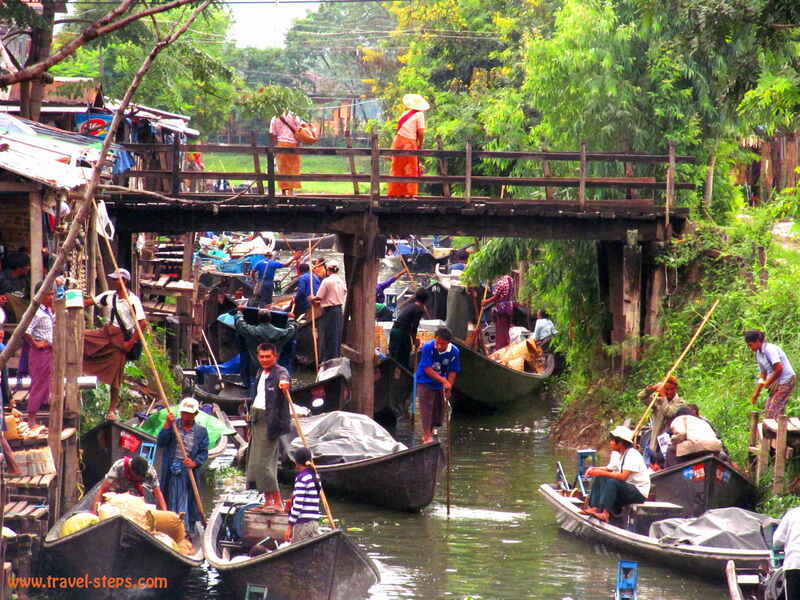 I guess, many take the slow boat, because for them, it really is the cheapest way to travel. 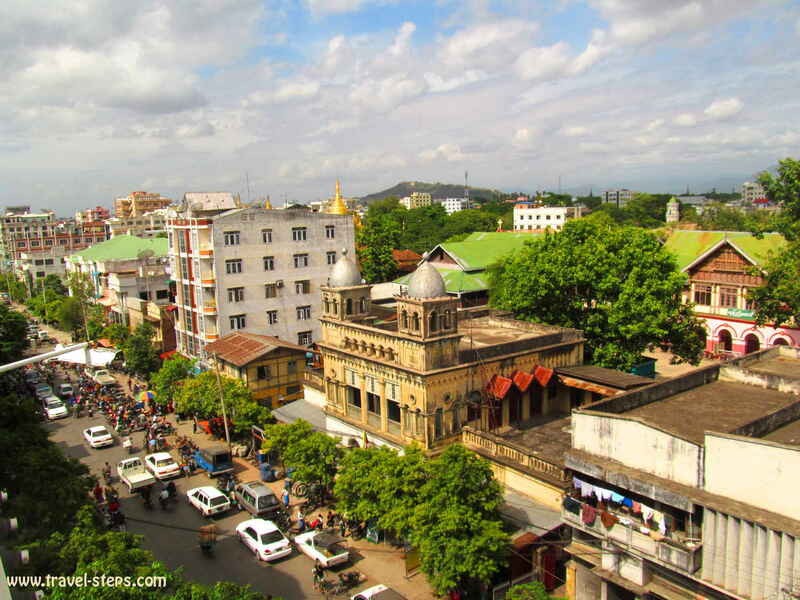 Mandalay is a massive city with one million inhabitants, traffic, noise, markets and shops. But at the same time, it appears like a village, where people wash themselves at the public taps just next to the roads, where life on the streets seems to have an end before midnight. With a rental bicycle, I made my way to Mandalay Hill, passed temples, Buddha statues. From up there I had a great view over the city. A monk chose me to improve his English language skills. He knew the names of all famous German soccer players. He told me, that they had satellite TV in his monastery. That was why he was able to watch a lot of soccer, his favorite sports. On the way down, I saw a few monks queuing at a little white tent. An astrologer was offering his service there. I became curious. He was dressed in white. His teeth looked red because of the betel nut chewing. And for 2 US-Dollars, he started to predict my future. He was able to tell me at what age I will marry as well as the religion, country of origin and profession of my future husband. I’m still exited, if all his predictions will come true. 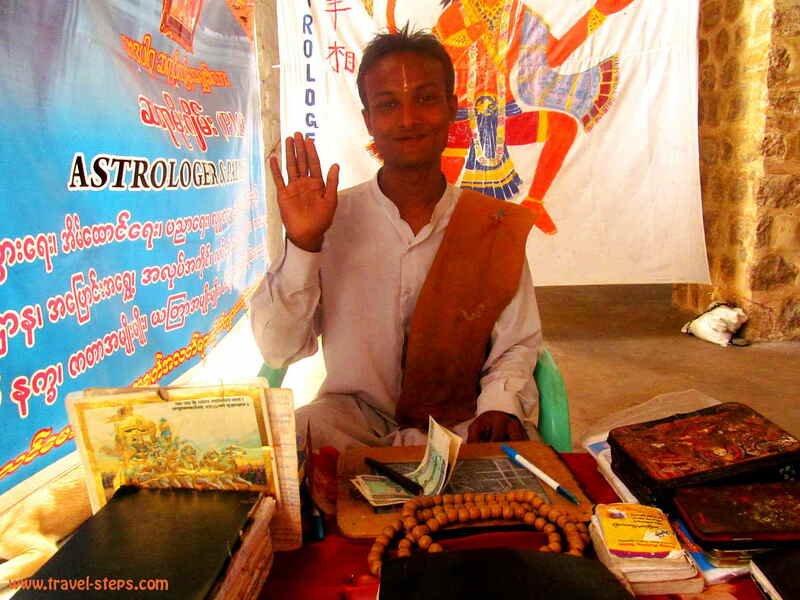 But anyway, Astrology is very popular in Myanmar and it was fun to get a taste of it. When I came down from Mandalay Hill to get my bicycle, I had to realize, that the tire was flat and broken. I had wanted to safe the money for a bicycle guard. Now, I saw the result. And I really didn’t believe in coincidences. But I had no choice. Luckily the repair shop was just next door. Well, as I said, I don’t believe in coincidences. So I had to pay something like 50 Cents to get the tire fixed and rode back to Mandalay city. 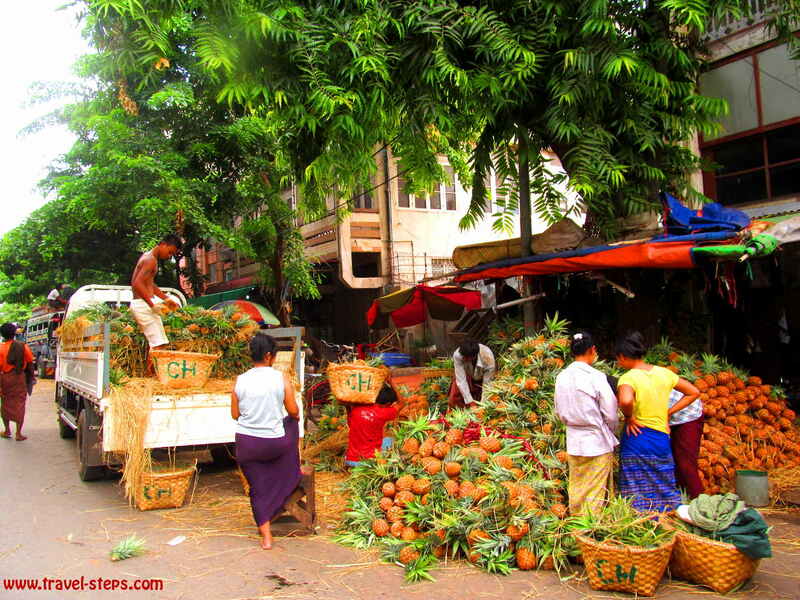 In Mandalay, I stayed in the Garden Hotel, right in the city center, 300 meters away from Zegyo Market. It was alright, the staff nice, the rooms small and with a lot of sticky air inside. 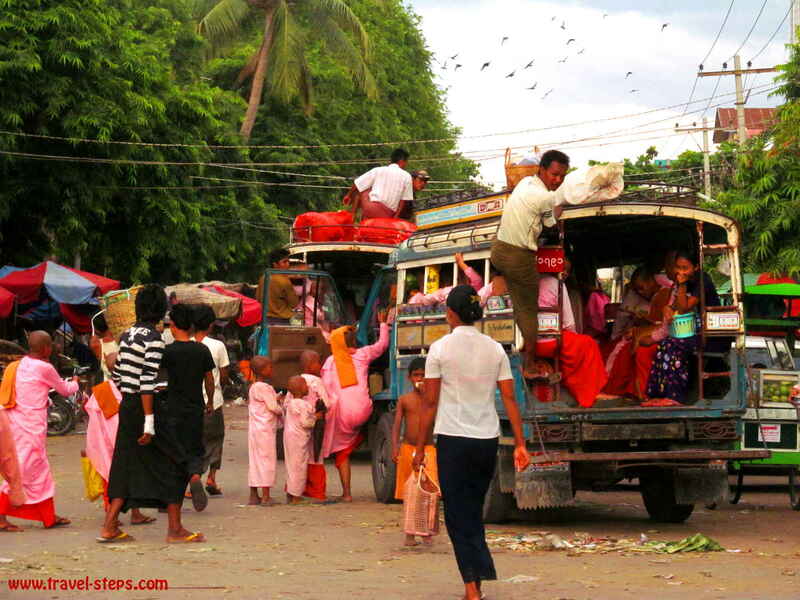 The temperatures in Mandalay were hot and tiring in August. The hotel’s roof terrace offered nice views and space to meet fellow travelers and to catch a breeze with a bit of luck. It was a good place to be right in the middle of action. I made the experience already in Yangon, that in Myanmar, you get less value for money than in the rest of southeast Asia. If you want to have a really nice room, you obviously need to pay more than 10 US-Dollars per person. It’s not a low budget traveler’s place to have sweet dreams. 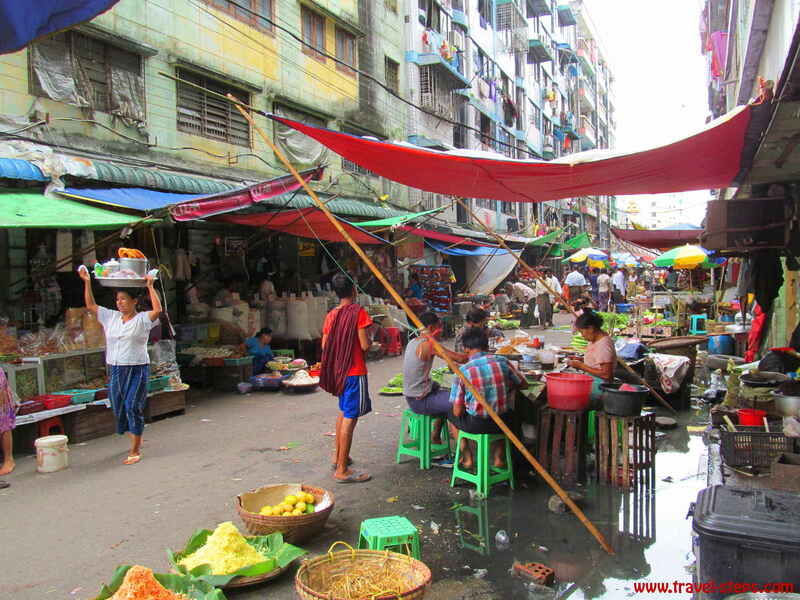 I enjoyed discovering the vibrant city, the markets, the night market. Once, I went for lunch into a restaurant and had no clue what to order. Suddenly, some smiling strangers at the neighboring table offered me to try their food with their forks from their plates. I wasn’t sure, how to react. I guessed, it would have been impolite not to eat from their plates. I just realized afterwards, what it was: intestines. I chewed bravely. And made sure, that the cook prepared something vegetarian for me. In Mandalay, I even went to a hair dresser after backpacking half a year around Asia. He got nearly desperate with my thin middle European hair, but tried for one hour to do his best. I wouldn’t recommend getting a haircut in Myanmar, if you don’t fit into the typical hair type sheme, but long-term travelers don’t always have a choice. And the hair washing including a massage was amazing. One cool thing, I experienced in Myanmar was the visit of the famous Mahamuni Pagoda with its statues and peaceful atmosphere in spite of the masses of tourists and pilgrims. I enjoyed the atmosphere around the area around the this Buddhist temple with lot’s of food stalls and a fairground atmosphere outside. If you have some spare time, it is worth a visit. Watching the performance of the “Moustache Brothers” should have been one of the highlights of my trip. Well, it was not. The show starts in the evenings in 39th street in Myanmar in a small provisional theater hall fitting maybe an audience up to 20 people. The artists had been well-known – better said famous – for their satirical and critical attitude towards the regime in Myanmar. Their brave provocation and protests had brought two of them to jail for many years. After their release, they had not been allowed to perform in front of a Burmese audience anymore. Just tourists are able to watch the show of the “Moustache Brothers” in English. Meanwhile, two remaining “Moustache Brothers” and a lot of their family members are performing on stage. They show a mix of classical Burmese dancing, slapstick and some critical comments about the regime. And I found it a bit difficult already after a few minutes. I truly respect the guys for their effort to fight for changes in their country. I admire them for their braveness and what they have gone through, but their show didn’t really catch me. I don’t understand, why guidebooks are not honestly writing about that, but are pushing the show instead. In my opinion, the jokes were not really good. And I didn’t understand, why they showed the traditional dancing. I would have been much more interested in their real story, experiences from prison, how their fellow inmates reacted, their neighbors, their families and how they managed to keep going, how it is really for them to live in Myanmar. The entrance fee is 10.000 Kyatt, around 8 US-Dollars. Honestly, I wasn’t happy with the show, but of course still happy to support the „Moustache Brothers“. It was still worth to catch a glimpse of Burmese political history and to meet them. 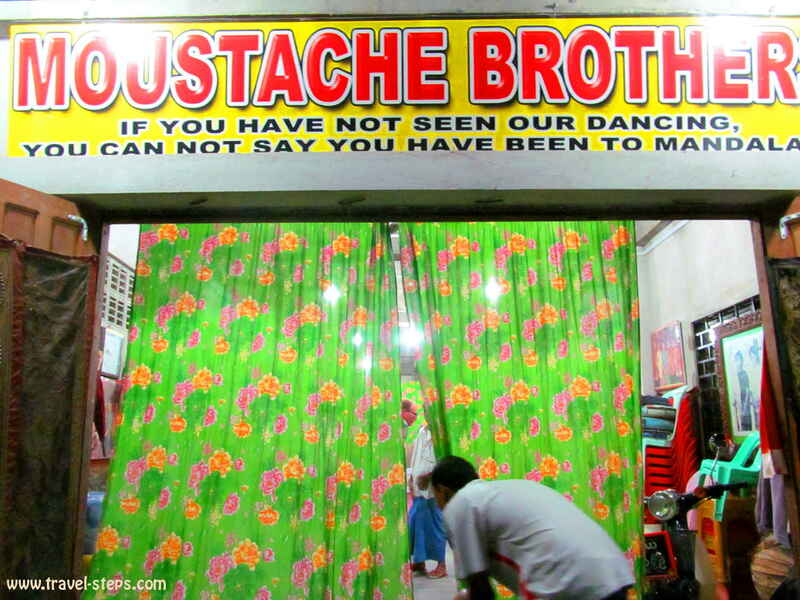 Find the Moustache Brothers on Facebook. Read more comments about the show on Tripadvisor. I felt like walking around in an old US-western town with a lot of horse carriage traffic and artful decorated old wooden buildings, that have seen better times already. Dusty unpaved roads, open air markets with a lot of food stalls. I had gotten to Pyin oo Lwin by pick-up from Mandalay city center. The two-hour-ride on bumpy roads in the old car with too many people and luggage around me had cost a few cents. The car was leaving almost next to my hotel in Mandalay. The Garden hotel staff had explained to me how to find it. It wasn’t a problem at all. And it was probably the cheapest way to get to Pyin oo Lwin. Traveling with me, there was an Israeli girl, that I had met at the hotel in Mandalay. She was pretty cool and we had decided the evening before to travel on together. In Pyin oo Lwin, we managed to stay in the probably cheapest and worst hotel in town, the Golden Dream Hotel, Mdy – Lashio Road 3. They have been doing some renovations while we were there, so it can be much better now. Who knows. We were both traveling on a very low budget. So, the price for saving some money was coping with dusty floors and slightly dirty rooms and common bathrooms. Anyway, I liked the slightly chaotic, but very inspiring atmosphere of the town. From our hotel, we were able to watch the Purcell Tower, the town’s famous clock tower. And after we had bought some second-hand t-shirts on the market, we went to the National Kandawgyi Gardens on our rental bicycles. It’s a big park, that had been created already in English colonial times. The entrance fee for tourists: 5 US-Dollars. Probably, I expected too much. Don’t. Locals pay a lot less. And it’s true, that you can find great nature for free in Myanmar, but not a lot of free public spaces with a gardening culture. 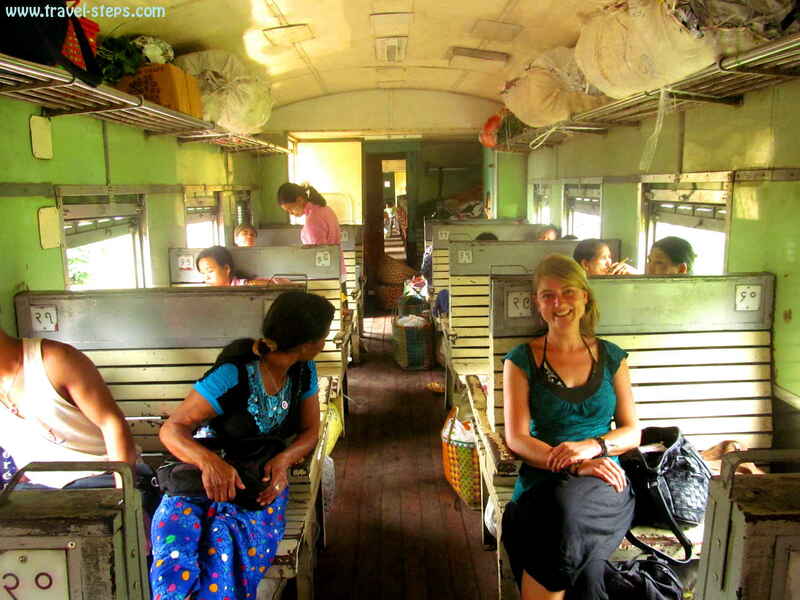 With the train, my Israeli travel mate and me went to Hsipaw. Ordinary class. Wooden benches, open windows instead of air condition, holes in the floors as toilets and amazing views on the countryside. 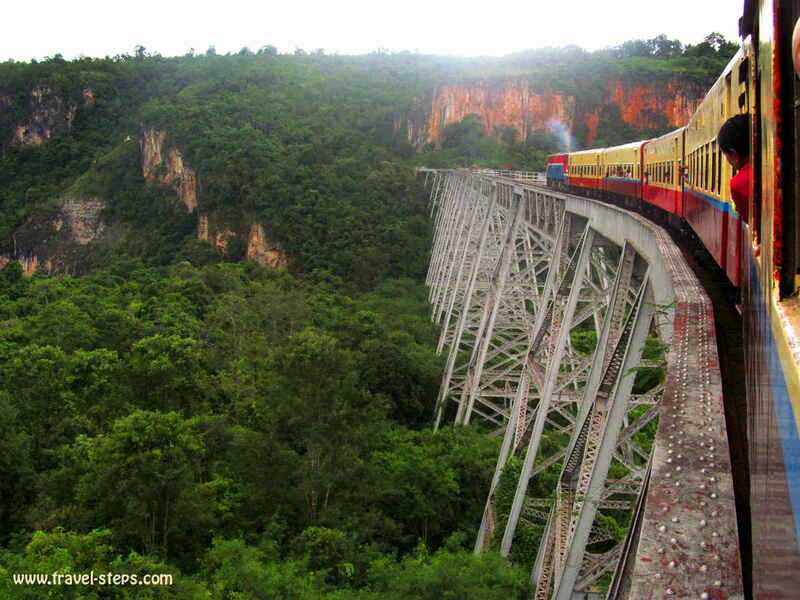 It’s a very scenic ride and goes over the famous Gokteik Viaduc, built in 1900 and by then the highest bridge in the world. 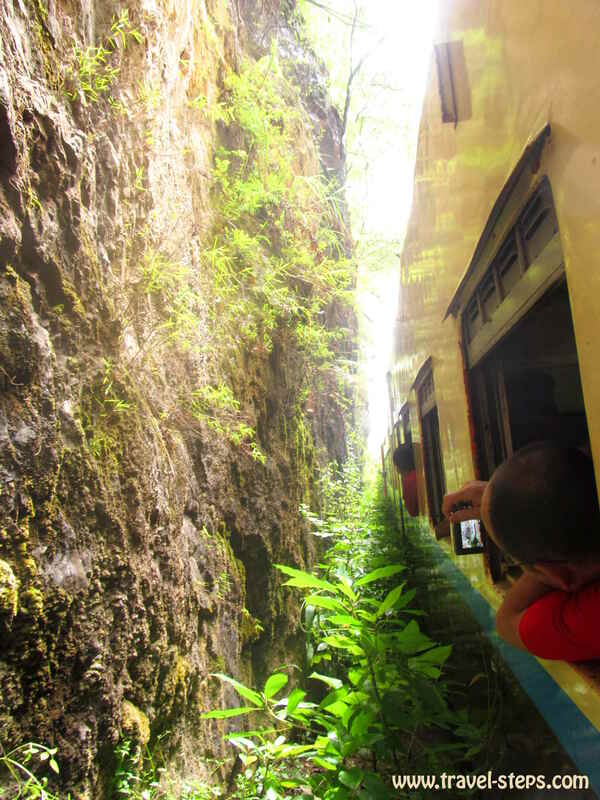 Some travel writers call it “One of the ‘must do’ railway journeys of the world”. It was just a few US-Dollars for the trip. I would definitely recommend it. 6 to 10 hours are manageable in the ordinary class, although many travelers travel first or upper class. And at every stop, some women sold food and sweets directly in the train to the passengers. Our Burmese fellow travelers were great, friendly and as usual very talkative. We didn’t get bored for a minute. But yes, Myanmar’s railway belongs to the government. Buying a train ticket also means supporting the regime. 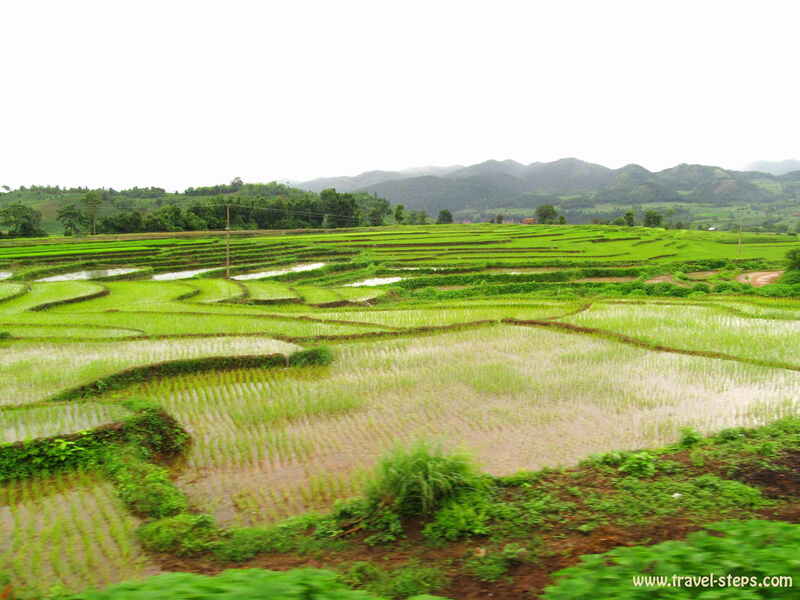 Hsipaw wasn’t extremely exiting. A small village and a base for all those, who want to go on hikes. We stayed at Mr. Charles guesthouse, Auba Street, 105, a very neat and clean place, where you can book and start trekking tours. It also is a backpacker hangout, although I read about a lot more hospitable places in town. The following morning, we started on an overnight trek. 14 kilometers uphill with a very young and shy guide. It was hot. First, we all were in a perfect mood and had a good time. 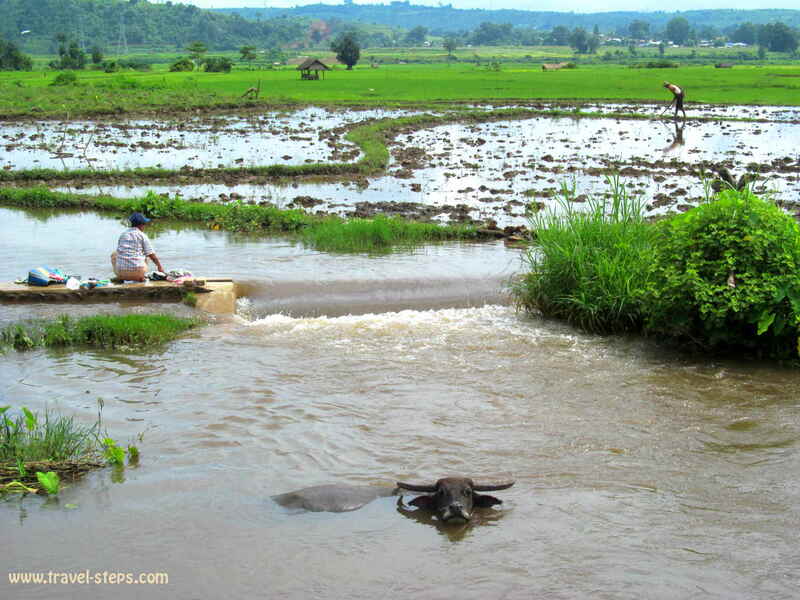 But after a while, we were fighting against ourselves instead of fully enjoying the landscape full of traditional farm houses, rice fields, hills and valleys. We were 6 people in our group of different ages. More or less exiting and overweight. 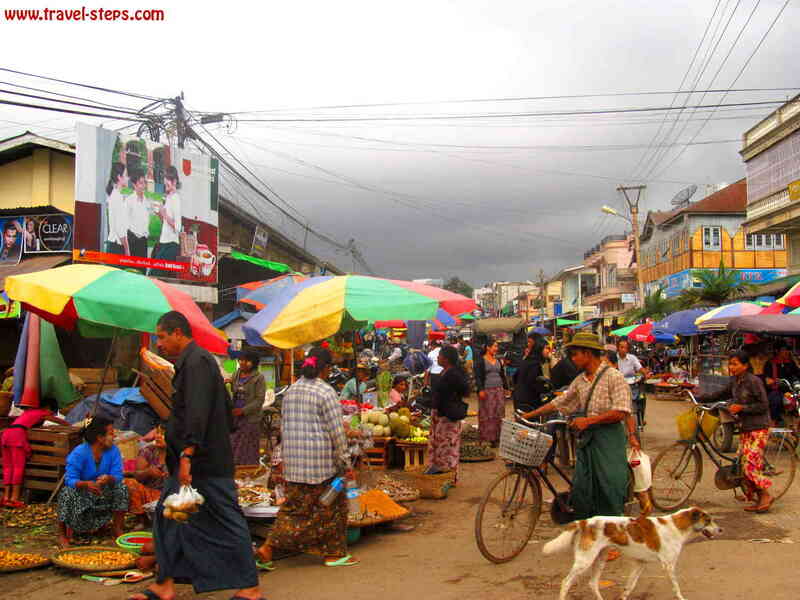 One Dutch guy in his 50s had to give up and to return after one hour to Hsipaw. The rest of us went on, including his wife. We weren’t well equipped, didn’t carry enough water, nor enough food.We had underestimated the trip or were just all in a bad condition. In the end, we were sharing our last cookies and felt really really hungry. Still, we didn’t want to give up. We were exhausted, when we arrived at our destination. At a small mountain village. It was a beautiful and idyllic place. 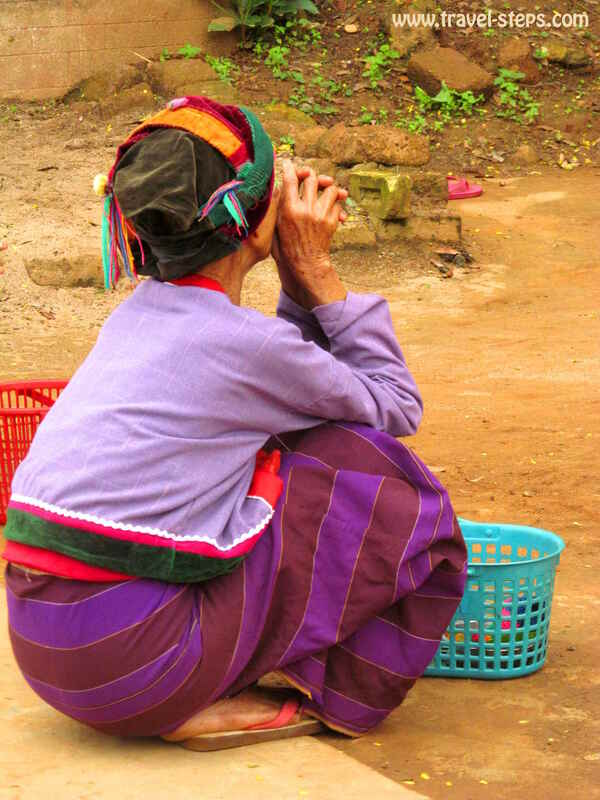 Women were walking around in their very colorful traditional tribal fashion. We had arrived at the Palaung people. The children were welcoming us with overwhelming happiness and curiosity. And when we started to take pictures of them and made little films with them, the got almost crazy. It didn’t matter to them, that their shirts had holes and were covered with dirt. They were playing very happily. We slept at a homestay with a family. 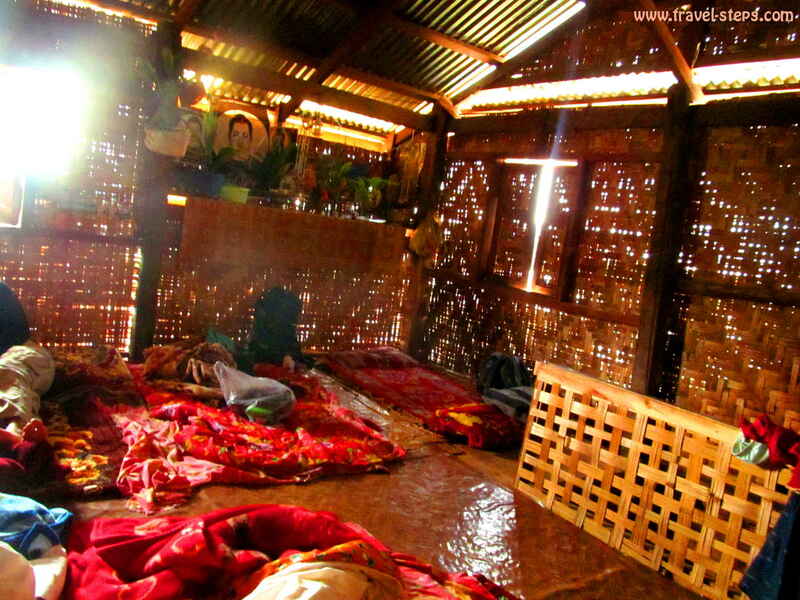 Our mattresses were on the second floor of a basic house of wood or maybe bamboo. And we were very happy about the dinner. Simple, but very tasty. Rice, corn, soup, noodles and omelets. We got more and more food. And we heart about the life in the mountains, about the tribal people’s problems and about the war, that is going on between the government and some rebel armies. In Myanmar, there are still conflicts till today, some areas are officially not accessible for tourists, some borders closed. As a normal tourist, you see just half of the country’s reality. 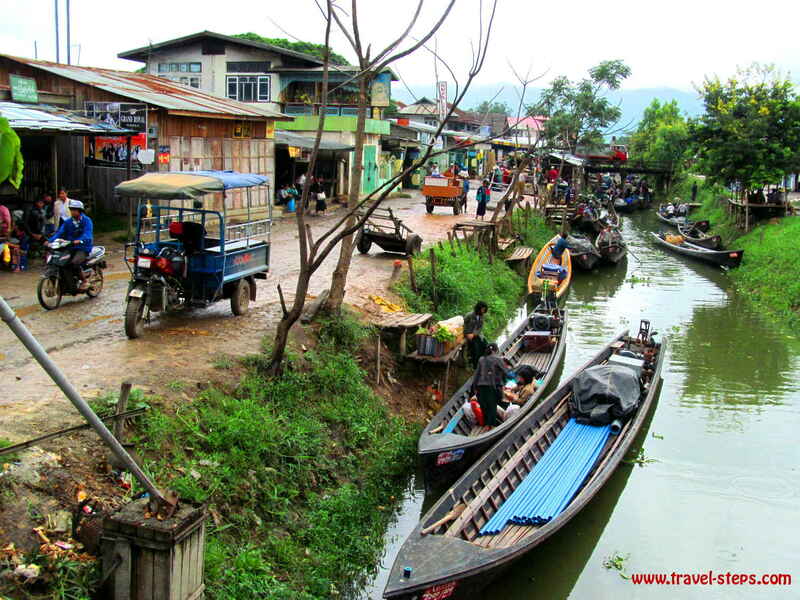 And of course, most tourists are happy to have a good time in Myanmar, to spend a 2 or 3 weeks holiday in an exotic place. And many tourists don’t even know, that even their home countries have imposed economic sanctions against Myanmar and that the country’s regime is still criticized for violating human rights. On our trekking tour, we spend the night in the mountain village on the mattresses next to each other. Some were snoring louder, some didn’t. Mosquitos were biting me. And I tried to use the toilet outside the house as little as possible. There was a monster spider sitting in there. And I was a bit ashamed to admit, that I am afraid of spiders. In the morning, we went to watch the monks waiting to get offered some food by the village people. It was a very interesting experience. After three weeks in the country, I had learned and experienced a lot. I would definitely recommend traveling to Myanmar. The people there are worth being met. No drugs and criticizing the government! 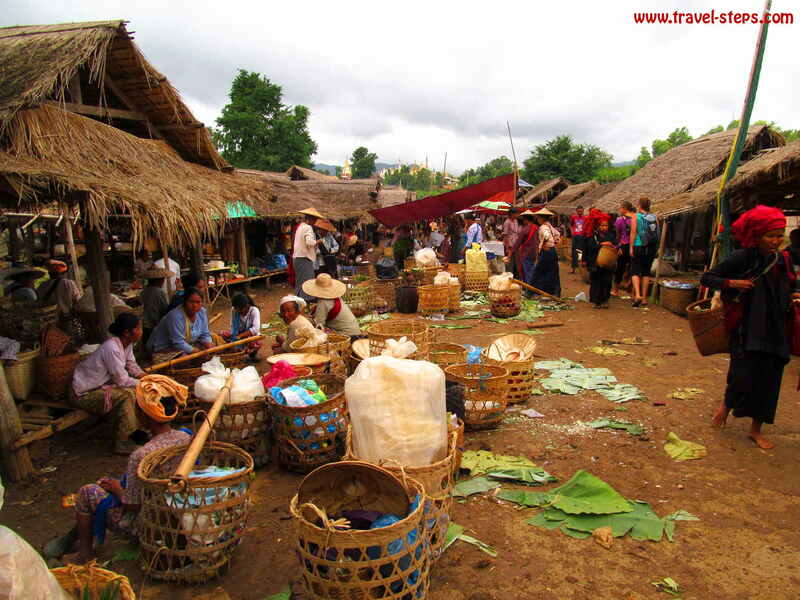 If you want to keep your smile, There is a lot of stuff to keep in mind while traveling in Myanmar. The country is in a stance of change, still governed by a military regime. Don’t get yourself in trouble criticizing the government in public just because you feel like it. You can risk a severe fine for that. Be aware, that there exist severe fines for drug use and possession – marijuana included. I really haven’t seen anyone smoking it or dealing with it openly – in contrast to many other southeast Asian countries. But I have just been there for 3 weeks. And it is well-known, that in some areas of the so-called “Golden Triangle” farmers have derived benefits from poppy cultivation. Also opium consumption is still an issue. Read the UN report about opium production in Myanmar and Laos being stable at high levels. Locals have a quite conservative dress code keeping shoulders and legs covered. I felt more comfortable sticking to that. Don’t hug or kiss your partner. And if you are gay, don’t make it public as homosexuality is still illegal in Myanmar. The interesting thing is on the other hand is, that many man walk around arm in arm in the streets. Something really unusual for friends in many western societies. Don’t forget to bring cash – US-Dollars! 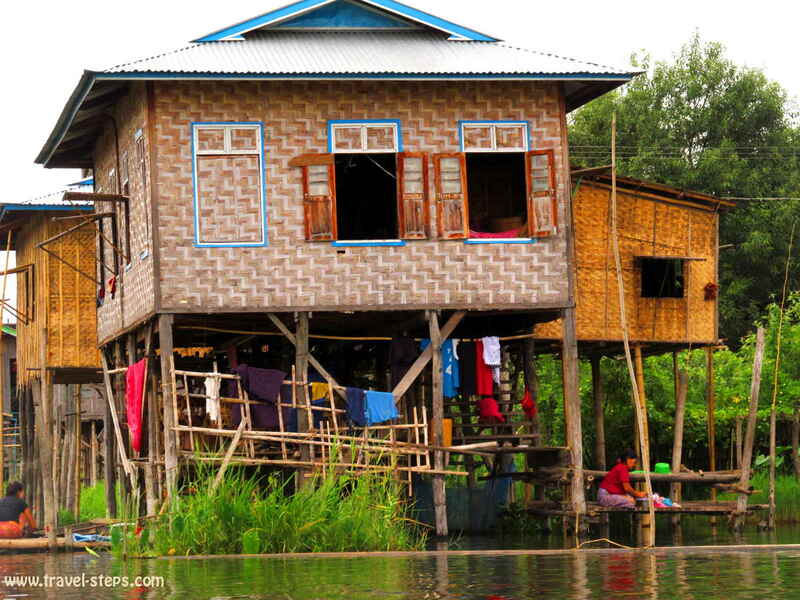 Myanmar is a lot more expensive for foreigners than for locals. There are different prices – more expensive prices – for foreigners, when it comes to sightseeing as in the Shwedagon Paya in Yangon or certain tickets for public transport. It’s the way it is. 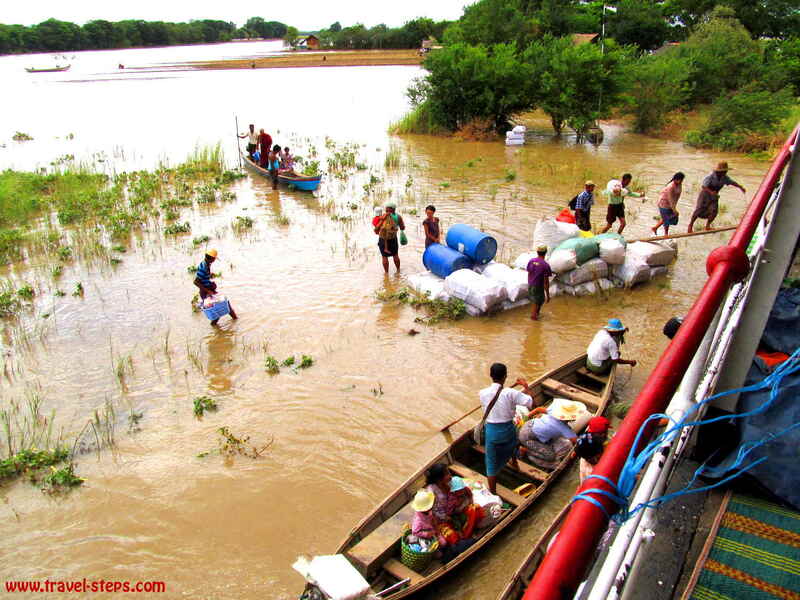 For example, I had to pay 15 US-Dollars for a slow local boat, run by the government, from Bagan to Mandalay. Locals had to pay for the same boat just a few cents. These prices are set by the government, not by the locals. So it doesn’t make sense to get angry about it or to bargain. 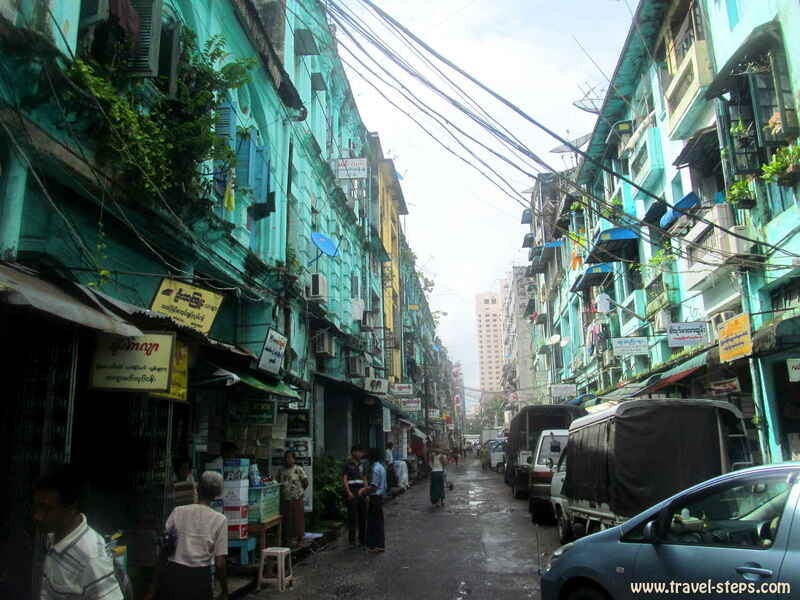 You have the choice of traveling to Myanmar or to leave it. 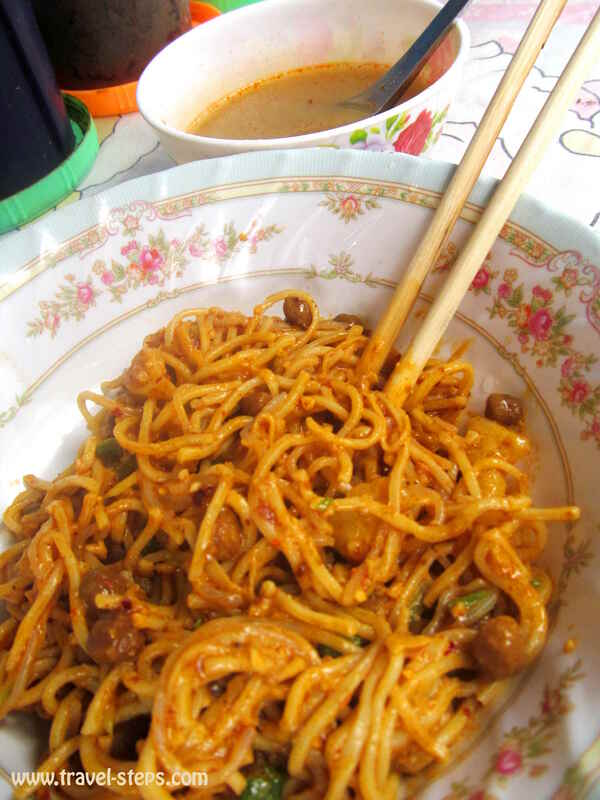 Try to travel low budget and to eat in local restaurants, not at government-owned hotels. There are ways to support the people, not the government. Just look around. 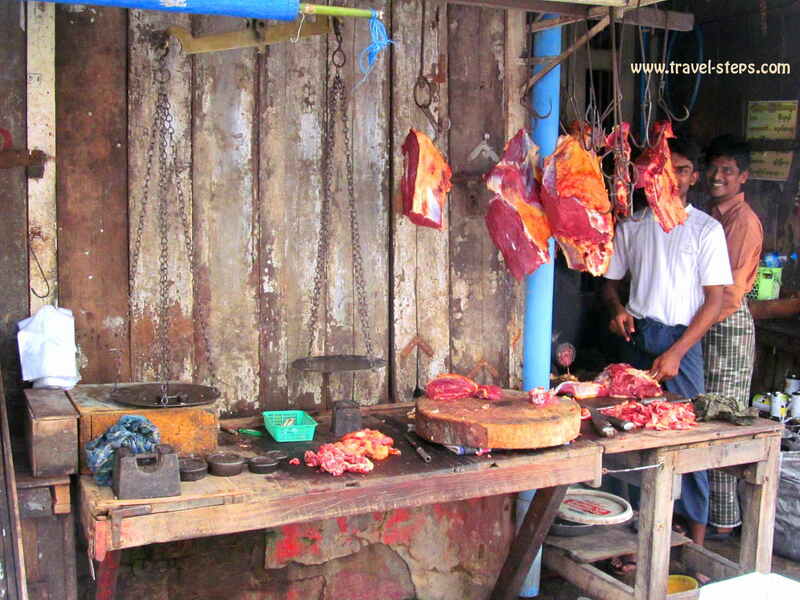 The less money, you spend on hotels for example, the more you can spend on local markets. Be aware, that trains and some ferries are also government operated. But some routes are just so amazing, that I wasn’t able to resist. Nowadays, there are a lot of cash machines in Myanmar. That has changed during the last years. You should find them in big supermarkets with international products, big hotels and international airports and markets for tourist. But don’t rely on to find one whenever you need it. So take some cash. US-Dollars is the currency to have. Clean, brand new and without any marks. Dollar notes older than the year 2000 will not get accepted. For expensive rooms, flight and train tickets, you might be able to pay in US-Dollars. If you want to get samosas in the street, you need to change your money into the local currency Kyatt. Try to change your money in official exchange places to avoid scams. But well, when I arrived, the official places had been closed, so that I exchanged a small amount of money with a random guy in the street. I was careful and got the right amount of change at an exchange rate better than at the airport. Myanmar is also a world with extremely slow internet connection. It was almost impossible to open my email account. My mobile phone wasn’t working at all. Meanwhile, you can buy local cards for your mobile phone. If you need a phone to make hostel reservations or do research while traveling, it can make sense. But the phone won’t work in every place in the country.